Here at Golden West Exteriors, we want you to be happy with the Edmonton siding installation jobs that we perform. On our end, that means showing up on time, getting the job done right and to client expectations, and then leaving the place in a better condition than we left it. But it also means helping our clients understand their material options, and guiding them to a choice they can be happy with. 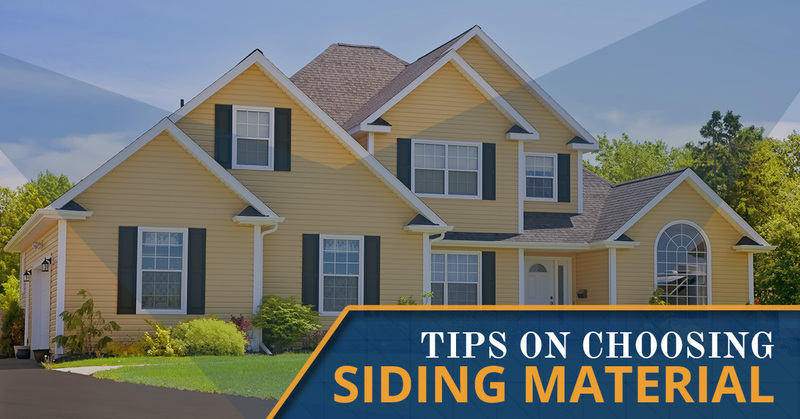 To that end, we thought we would list some tips on choosing siding material here. Major home renovations, like getting new siding installed, are a big investment. To avoid having to make it a second time, consider how long you will need the siding to last. Are you planning to live in your home forever? Then the upfront cost of a more durable material may be well worth it. Being that your siding is your home’s main defense against the elements, it isn’t something you generally want to skimp on. However, there are more affordable, quality material options for less of an initial investment. Different siding materials come with their own upkeep needs. For instance, vinyl and cement siding are two generally low maintenance options. This is because neither requires repainting in their lifetime, and both can be cleaned as good as new with a simple spray of the garden hose. There are a lot of things to worry about when it comes to maintaining your home, and unless it is something that you like focusing on, siding should not be one of them. Besides its function, protecting you and your home from the elements, siding needs to add to the look of your home as well. What is the style of your home? This will likely largely determine what kind of siding that you end up choosing. For instance, most traditional homes tend to look good with wood siding. However, wood siding can be a little more maintenance than other materials, so weigh that in your decision. Of course, nowadays with advances in manufacturing technology, even vinyl siding can be made to mimic the look and texture of quality wood siding. Whatever material option you choose, make sure that you are happy with the way that it looks. Here at Golden West Exteriors, we perform roofing and siding work in Edmonton. We stand by the quality of our work, just ask any of our previous happy clients. Feel free to check out our showroom to see for yourself the quality of what we produce. For more information about our Edmonton siding installation services, please do not hesitate to give us a call at your earliest convenience. One of our friendly and knowledgeable representatives will be happy to answer any questions that you may have. We look forward to hearing from you!